After breakfast, John and I got back on I-5, heading toward Sacramento, where we’d pick up I-80 East. We decided it might be more fun to take some state highways and byways to I-80, rather than get tangled up in the traffic around Sacramento, so we jumped off the interstate at a town called Williams and bore east through the California farmlands. It was actually restful to have something else to look at, and the time passed quickly. We stopped at a roadside fruit stand and bought locally-grown plums, cherries and pistachios (they were delicious; I wish I’d bought more). Eventually we picked up I-80, but jumped off it again when we got into the vicinity of Lake Tahoe. 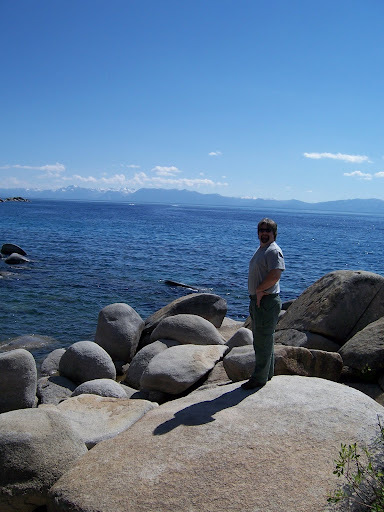 John had seen Tahoe before, but I had never been there, so we cruised around the northern part of the lake for a bit, then stopped for lunch, then found a place where we could get down to the lake itself. We’d tried at other parks, but discovered that they were private parks and not for the likes of us, so we were grateful to finally stumble on a public park around the east side of the lake. There were a lot of big boulders to climb down, and the weather was bright and beautiful, with a nice breeze coming off the lake. The downside was afterward, when we got into the car and I discovered that my left ankle was bruised and swollen. 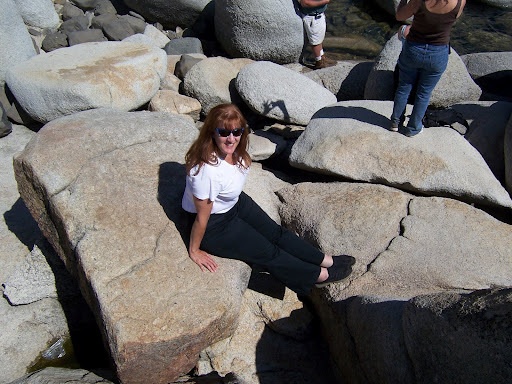 I don’t know what I did to it or when (I only had a twinge from one knee when climbing on the boulders), and it didn’t really hurt, but it was disconcerting all the same. After we got into Nevada, we stopped to get some ice and I traveled the rest of the day with my foot elevated on the dash and an ice pack on my ankle. Nevada was not terribly exciting to look at, and we were glad to stop for the night in Elko. Had there not been water on the Flats, I believe I would have been hard-pressed to keep John from racing the truck across the Speedway, which we really didn’t need for him to do, it being full of our luggage, traveling accoutrement and a lot of Oregon wine. We found a spot that was mostly dry, and he walked out a good ways to get a feel for it. Even so, he said there were moments where his feet broke through the damp salt layer, and I was glad that we didn’t drive on it. 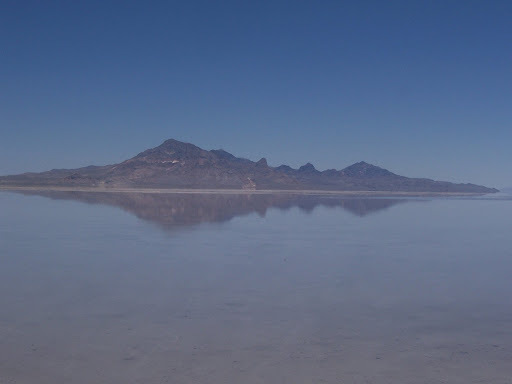 From the Salt Flats we continued east into the Salt Lake City area. I really didn’t care anything about stopping in Salt Lake City, but we knew we HAD to stop and see the Great Salt Lake. Now, we’d SEEN the GSL on our way west, when we picked up I-84 near Ogden, but we hadn’t actually VISITED it, and certainly had not paddled in it. Swollen ankle or not, I was going to paddle in it. 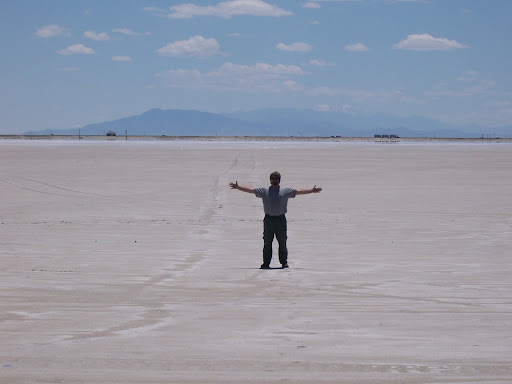 As we approached Salt Lake City, I kept getting fooled into thinking we had reached the Lake by the same kind of standing water we’d seen on the Bonneville Speedway. Eventually, though, we saw the Lake to our left, took an exit just past a marina to have a look, and stumbled on a very strange-looking edifice. It was a rectangular box of a building, with Moorish “onion bulb” towers at the corners and gateway. We found it quite peculiar – nothing seemed to “fit,” and it seemed to be abandoned, although there were signs directing the way to an indoor gift shop. We opted to check it out after walking down to the edge of the Lake, which shimmered in the distance about a quarter mile away. I liked that guy’s stylin’ headgear. After my paddle, we went back toward the oddball building, which turned out not to be abandoned after all, as there was a young man mowing the lawn. We found our way inside to the gift shop and discovered that the building is a fairly famous one, or at least, the rebuilt version of one: The Great Saltair. This was a turn-of-the-century resort, and as was often the case with resorts of that era, it burned down more than once. The current Saltair is located a little ways from the site of the original, and its Frankenstein-like appearance is due to the building actually being an airplane hanger in its previous life, with the onion bulb decorations planted incongruously on top. Due to the capricious nature of the Great Salt Lake, the current Saltair was flooded shortly after it opened. Several years passed and the waters receded, but retreated so far that the Saltair now sits in its high and dry position. Given time, I guess, it might find itself flooded again; meanwhile, it’s home to rock concerts on a semi-regular basis. It’s a bizarre sight, all the same – and just a wee bit depressing. We got hung up in highway construction traffic as we headed out of Utah into Wyoming, but eventually we were backtracking the very path we’d taken when we’d headed west. We stopped for the night again in Rawlins and stayed the next night with my sister and her family in Nebraska. Our final night on the road was in Greenfield, Indiana, and we reached our home on Monday the 22nd at about 9:30 PM. Unlike the conclusion of our cross-country trip two years ago, we did not have any disasters waiting to greet us. The A/C had moved out of its vacation programming and the house was nice and cool. Our neighbor had mowed the grass. The garden was growing nicely and the potted plants in the house and on the deck were doing just fine. We were home again, home again, jiggety jog. Oh, and John creamed me in Punch Bug again – 168 to 111. One good thing about FTC being down, I've actually managed to catch up on your blog!What a wonderful road trip you've had. Beautifully chronicled as always. Sorry to hear about your ankle, hope it rehabilitated quickly.